The New York comptroller election of 2010 involved the first election campaign of Democrat Thomas DiNapoli to the Office of State Comptroller. DiNapoli was appointed as Comptroller by a joint session of the New York State Legislature on February 7, 2007. 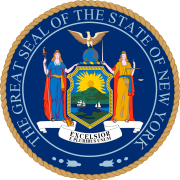 In the general election on November 2, 2010, DiNapoli defeated Republican nominee Harry Wilson. This page was last edited on 7 April 2019, at 17:14 (UTC).